I love this outfit. One of my faves of you. I love that clutch too! What a great outfit! You look SO good! Such a fun summer look! This outfit looks so great on you! I didn't think I could wear a jumpsuit, but its so flattering on you that I really want to try one now!! K, your hair. Let's take a minute to just admire. Everything else is fab too! Your hair looks amazing and I looove those shoes! I love everything about this! Especially the necklace. Great look! Love that romper! You look stunning, and in love with this entire look. Cute outfit and I'm in love with your hair!!! Would you consider doing a tutorial? Such an incredible look girl. LOVE those lace up heels (still!) And please please do a hair teasing tutorial! Your hair always looks killer!! 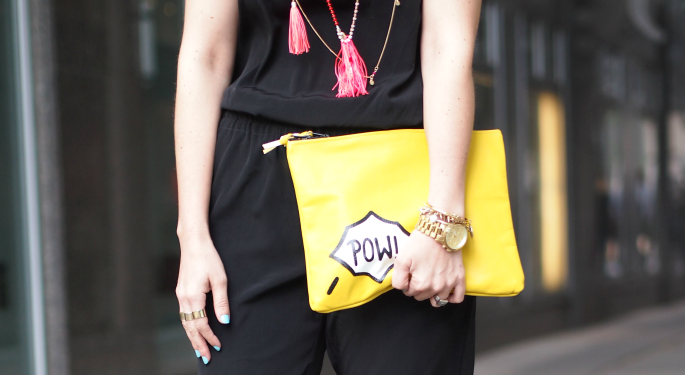 Such a cute outfit...love the strapless jumpsuit paired with the colorful necklaces!